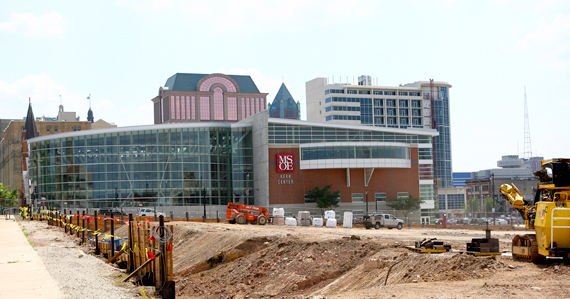 Excavation begins for development along the former Park East freeway. Photo Credit: City of Milwaukee In Milwaukee, Wisconsin, the Good Jobs and Livable Neighborhoods Coalition — comprised of 27 community-based organizations working to improve economic conditions in the city — has leveraged a Community Benefits Agreement (CBA) to ensure that development practices are equitable and residents share in the benefits of a 64-acre redevelopment in the heart of downtown. The Park East Corridor redevelopment accelerated with the demolition of an abandoned freeway spur in 2002, which opened up 26 acres of underutilized and blighted riverfront property owned by the city of Milwaukee and Milwaukee County. Initial development plans for the riverfront parcels spurred the Good Jobs and Livable Neighborhoods Coalition to campaign for the adoption of a CBA. CBAs are legally binding covenants made between developers or government bodies and community groups that require development on specified lands to meet outlined thresholds for living wage standards, local hiring policies, affordable housing, and sustainable development practices. Once in place, developers must abide by the CBA in order to receive tax breaks and other forms of public assistance. There are more than 40 CBAs instituted nationwide.1 As a result of the coalition’s efforts, in 2005 the Milwaukee County Board of Supervisors passed a resolution that approved a CBA for 16 acres of county-owned land called the Park East Redevelopment Compact (PERC). The Park East Redevelopment Compact requires county-owned land to be sold competitively to developers whose proposals would provide the most jobs, increase the tax base, and enhance the community’s image while offering a fair price.2 Tax increment financing will fund the construction of roads, sidewalks, and other necessary physical amenities.3 Under PERC, the county agreed to fund affordable housing units equal to 20 percent of any housing units built on county-owned land. The compact also requires that transit options be expanded and that building designs incorporate green building elements to address environmental issues. A provision of PERC stipulates that at least 25 percent of the construction jobs must be from businesses designated as Disadvantaged Business Enterprises/Minority Business Enterprises and that 5 percent must be from businesses designated as Women’s Business Enterprises. To further support equitable hiring practices, PERC requires developers to provide apprenticeship programs and training opportunities to help low-income, low-skilled residents qualify for construction positions. PERC also requires that businesses locating in the development area, whenever possible, be locally owned and pay living wages. A community oversight board exists to monitor construction and subsequent development and ensures that all parties abide by PERC. Though temporarily slowed by the recession, development on PERC land will soon be underway. Park East Two, a partnership led by Park East Square Developers, is leading the development of a three-phase project on a two-acre section of county-owned land in the Park East Corridor that will comply with PERC. The first two phases will include two buildings with 181 market-rate units, 14,600 square feet of retail, and 246 parking spaces. The third phase was originally envisioned as a hospitality development, but the final plans are still undetermined. And developers and elected officials continue to pursue projects that will bring housing, hotels, retail, and community spaces to the corridor.4 With the first development moving forward under PERC agreements, the community expects that residents will share in the benefits that are derived from future housing and retail development on the remaining 14 acres of PERC-based land in Milwaukee’s Park East Corridor, such as an influx of additional local jobs and an increase in business for minority- and women-owned firms.